Royal Mail stealing my post. Over the past 3 years 6 seperate parcels have been "lost in transit". 5 of which were games. At first I thought it was a one off occurance so I let it slide. The retailers I ordered from always offered to send out the items again or give me a refund. But it would start looking suspicious if I kept saying my mail has been lost. I don't understand why the person who has been obviously stealing my items hasn't been fired yet. Each time I didn't recieve a item I had to complete a Royal mail lost order form and give it to the retailer. Surely Royal mail was suppose to investigate these missing items. If anyone has been in the same situation, what did you do? Any advice as to what I should do next would be greatly appreciated. 6 items in 3 years, that's nothing. My old manor I was losing several or a few every couple of months. Then after some idiot was bragging I found out it was a local fella who worked the round. He even stashed the empty birthday etc cards round his girlfriends, she wasn't too happy. Had to inform head office never did hear if he went to court but never did my round again. I go to the top of the tree and complain always has better results, send Moya Green (CEO) a complaint. It might not seem like much but every game I ordered online went missing. Which is very suspicious. The packaging makes it very obvious aswell. Whoever is stealing knows what it is. 6 items in 3 years, that's nothing. My old manor I was losing several or … 6 items in 3 years, that's nothing. My old manor I was losing several or a few every couple of months. Then after some idiot was bragging I found out it was a local fella who worked the round. He even stashed the empty birthday etc cards round his girlfriends, she wasn't too happy. Had to inform head office never did hear if he went to court but never did my round again. I go to the top of the tree and complain always has better results, send Moya Green (CEO) a complaint. Yeah I know that. It's just that the same type of mail keep going "missing". Nowhere in my post did I say I thought the postman was responsible. Contact your local police station, its stealing, which is a crime. Could be worse, you could have your stuff delivered by Yodel. Actually the rules changed recently and the retailers CAN'T claim from Royal Mail any more due to the vast increase in claims they've pulled the rug. I work for a business who sends out sacks of mail everyday and I was helping bag up at the end of the day and came across in the bottom of a mail sack about 9-10 small parcels sitting there and god knows how long they'd been there we handed them over the the collecting postman who seems astonished....we weren't as it's happened many times before. That is most likely what causes all the delays in mail - lazy postmen not checking things properly. I hope thats been said in humour. A lot of the time companies don't send out free samples and there is a thing called items getting lost. I hope thats been said in humour. A lot of the time companies don't send … I hope thats been said in humour. A lot of the time companies don't send out free samples and there is a thing called items getting lost. You signed up for that???? Yeah but one of the top stories is from 1913. Seemingly so. But everyone has to start somewhere, and it's pretty lame of you to pull him up for it. write to royal mail and complain that post keeps going missing for you and this is too much of a coincidence. 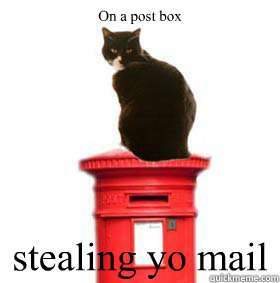 i would not accuse the postman of stealing as that may be libel since you don't have any evidence to support this. they may investigate it and find out that the postman is probably the culprit. Seemingly so. But everyone has to start somewhere, and it's pretty lame … Seemingly so. But everyone has to start somewhere, and it's pretty lame of you to pull him up for it. write to royal mail and complain that post keeps going missing for you … write to royal mail and complain that post keeps going missing for you and this is too much of a coincidence. i would not accuse the postman of stealing as that may be libel since you don't have any evidence to support this.they may investigate it and find out that the postman is probably the culprit. i had the same problem in my last house, over the 6 years we lived there,the first 4 years from sept to Jan every year i had £1000's of items go missing. mostly xmas pressies, ive made hundreds of complaints to RM, i went to the police who looked into my complaint and then RM send 2 " heavies " round to try and get me to stop complaining! at the end of year 4 i found out our postie had stolen 1000's of peoples parcels, letters, the police and RM investigators found them in his living room! was he sacked??? NOPE! he was moved to another area in my town! did i get my items ?? NOPE! thank god for companies like Amazon, play.com who replaced everything that went missing but only after i gave them the crime numbers i was given by the police,.